We’ve already spied the upcoming Mercedes E-Class facelift inside and out, but this is our first look at the hotter AMG E63 variant. Our spies have caught a camouflaged prototype of the high-performance sedan getting a workout at the Nurburgring, but as with most mid-cycle refreshes, the visual changes will be minimal. The most noticeable changes will be the headlights and taillights, which will adopt a new shape borrowed from the CLS. Elsewhere, the front and rear bumper designs will also be revised, but we’re not expecting any major changes. The prototype is also missing AMG’s signature Panamericana grille, but this will, of course, be added to the production model. Bigger changes will be found inside the Mercedes-AMG E63 facelift. While we don’t get a look inside the performance sedan, previous spy shots of the regular E-Class facelift have shown the cabin will be getting a significant overhaul. Among the changes will include a redesigned steering wheel, revised controls for the center console, and the new fancy MBUX infotainment system that will gradually be rolled out in all models in the Mercedes family. 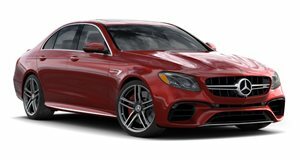 As for the powertrain, we’ll have to wait and see if Mercedes-AMG will extract any more power out of the E63’s twin-turbo 4.0-liter V8 engine in the upcoming facelift. It’s certainly possible since the GT 63 S 4-Door was cranked up to 630 hp, whereas the current E63 S is rated at 603 hp. The E63 is positioned below the new 4-Door version, however, so we’re not expecting it to get any power upgrades. No word yet when the updated Mercedes-AMG E63 will break cover, but its regular sibling will be unveiled first so it probably won't arrive until next year at the earliest.